Our turf is sold per sq/m. You should measure the area approximately. If you give us your dimensions on the phone we will be happy to assist you with your requirements. When placing your order you should take into consideration that turf should be laid within 24 hours for the best results. Orders can be made by calling our main office number - 01563 830200. You can also call our mobile number - 07769 688110. 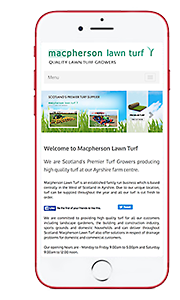 You can email us with your turf enquiry. We are open 6 days a week. Mon – Fri 9am to 5pm, Sat 9am to 12noon. We aim to deliver within 24 hours. Please place your orders at least 1 working day prior to your required date of delivery. Due to the fact that Saturdays can be busy please allow as much notice as possible to ensure your delivery can be guaranteed. Payment is required on or before delivery and can be made by cash, cheque or credit card.